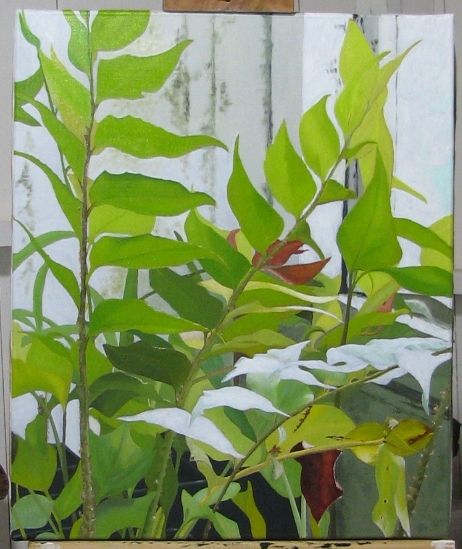 I have been working on an oil painting pretty much every day for weeks now. 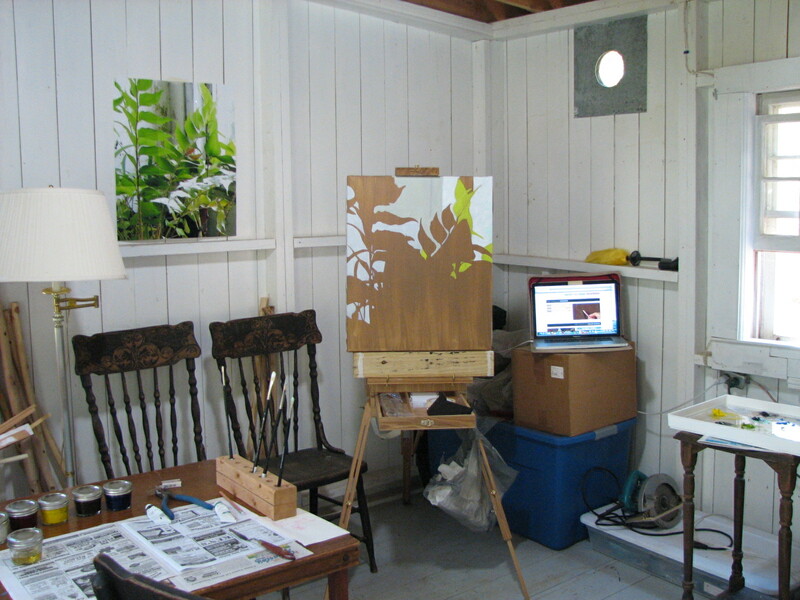 Prior to starting this project, I moved all my oil painting equipment out to the playhouse. I call it a playhouse because when I first moved up here, I converted the workshop outbuilding into a playhouse within a playhouse for my then young grandchildren. They are grown now, and the two little ones are not up here often enough to warrant leaving the space idle. I pretty much just put my stuff where I could, and got cracking. The Light Box is out-of-the-way at the moment but will need a better spot for ease in moving the light above. After building my Carder shadow box, I realized that it took up far too much room in my workroom, making working on other projects, if not impossible, uncomfortable. 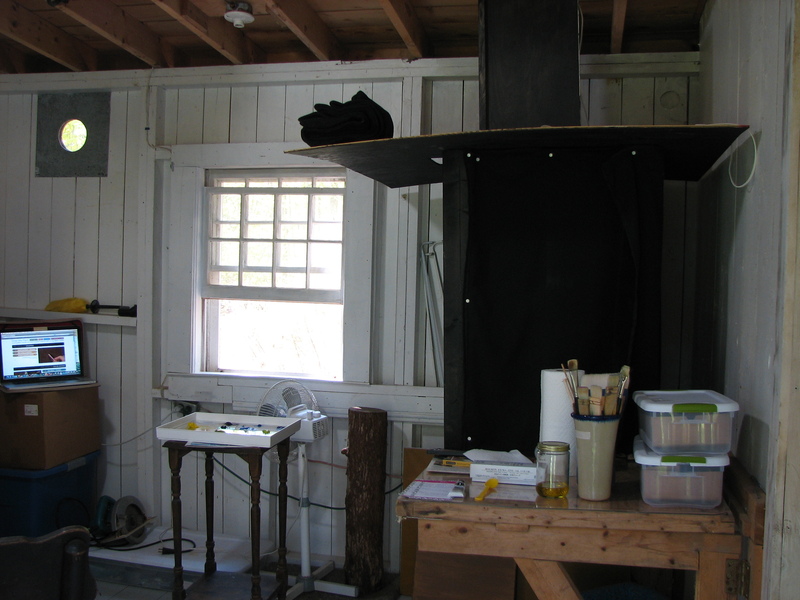 Also, the ventilation in the small workroom was not good for working with oils. So I moved the shadow box, lamps, and paints out to the playhouse which had become a bit of a storage area. Then I mixed my paints according to the two Carder medium recipes, and began a painting from a photograph I’d taken of my father’s mud room in Scotland. Paints are mixed and I’ve begun the painting. There’s a printout of the photo I’m painting, up on the wall. I began by painting all the negative spaces. That’s the DrawMixpaint website up on the computer – that’s just for the photo. If I use the computer when I paint, it’s to listen to an audio book. I found that my paints for the most part, did stay viable for the many weeks I worked on the painting. Only once did I have to scrape the pallet and remix my greens. Here’s the finished piece. I’m pretty happy with it.